M4A2(76)W “Sherman” medium tanks of American manufacture from the 1st Battalion of the 46th Guards Tank Brigade of the 9th Guards Mechanized Corps of the 6th Tank Army of the Red Army on the streets of Vienna. This tank battalion under the command of Captain Guard D.F. 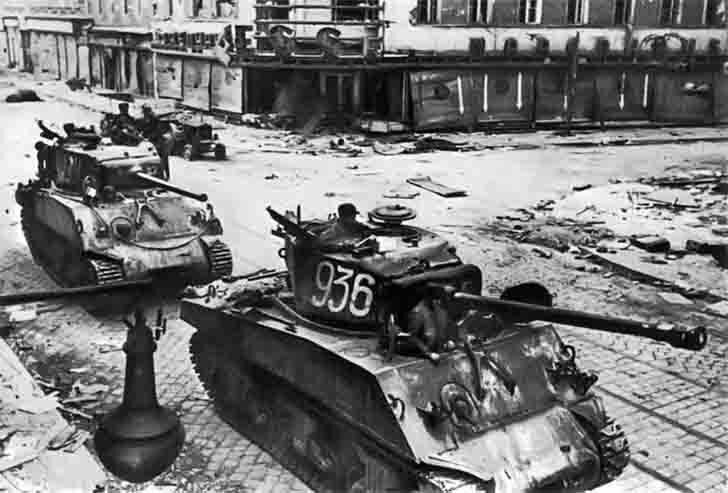 Loza, having overcome 100 kilometers, a number of barricades and resistance nodes, April 9, 1945 broke through to the center of Vienna and held it until the main forces of the brigade. The detachment was 18 of the M4A2(76)W “Sherman” medium tanks, 3 of the ISU-152 SPG and a company of infantry in 80 people. D.F. Loza received for this fight the title of Hero of the Soviet Union.